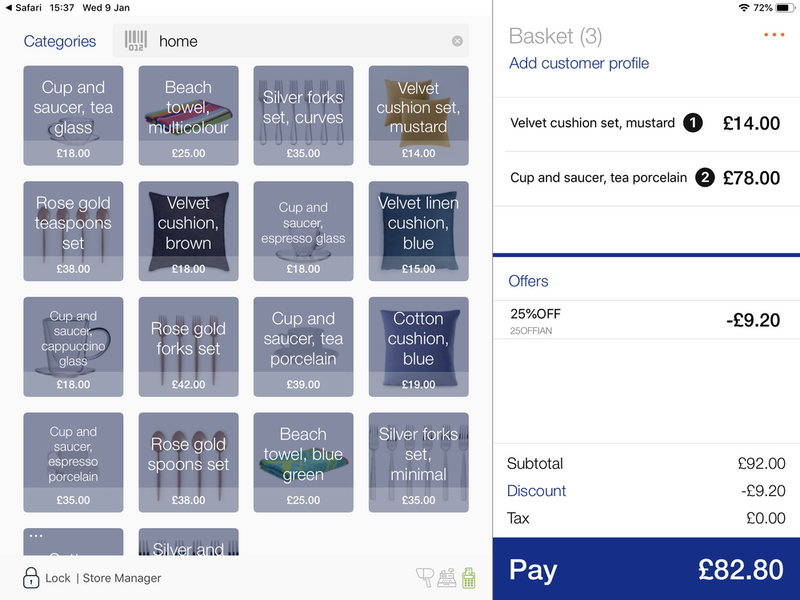 Brightpearl’s point of sale software is designed to integrate seamlessly with the rest of your retail business. With Brightpearl, new staff are up and running within minutes, armed with the information they need to engage and delight your customers. Intuitive and easy-to-use POS, access all inventory across multiple locations alongside full customer order and communication history. All sales, inventory, customer details and payments entered or updated in Brightpearl will be synced in real-time with your POS. Brightpearl is updated at all times to provide the fastest and easiest accessibility for all the units and functions across your entire business. You can select the level of permission for each staff member; for managers - the ability to perform end of day duties, overrides or discounts; for cashiers - taking orders and performing refunds. You can also set a maximum order discount level for each staff member to protect the business against discounting errors or malpractice. Our POS software integrates with PayPal Here and provides preferential rates for integrated card payments and discounts on PayPal Here hardware. Brightpearl POS integrates wirelessly or via Bluetooth to receipt printers, barcode scanners and cash drawers and setting up takes just a couple of minutes. Once a product has been added to the basket you can apply a line discount to that product as well as apply a discount across all products in the basket. You can either refund from a completed order or create a quick refund by adding a product into a new basket and mark as a product that you want to refund. You may need to serve a second customer while you’re in the middle of a transaction with the first customer. Place an order on hold that can be retrieved by the current cashier or any other cashier. Add a note to the order that is available to view in Brightpearl’s back office. After searching for a product you can view the inventory on hand across the associated products or the warehouses that you have set up for that store to be able to view. You can access further information on the product such as description, price, SKU, barcode, category and brand. You can also view any images that you have associated with the product. To ensure you have access to the latest information such as up-to-date inventory, you need to be online so the related functions can access the Brightpearl back office in real-time. But even when you’re offline, your products and cashiers are held locally in your iPad POS system, so if your store connection goes down or you’re at a retail show without a connection, you can still serve customers. You can easily set up which payment methods you want available for the store to use. Card payment reconciliation issues are reduced by using PayPal Here directly integrated with our POS system. Customer returns can quickly be processed with store credit that they will be able to use against future purchases. You can offer a customer the option to either pay the full amount later or take a deposit against the products they have purchased. You can reprint the receipt of a previous transaction or print a gift receipt. From a completed basket, simply select the products and quantities that you want to print a gift receipt for. Generating a refund from a completed basket will link the refund with the original transaction. Before completing the sale and starting a new transaction you have the opportunity to add an existing customer or create a new customer against the sale. You can email a receipt to the customer that you have assigned to the basket or send the receipt to one or more recipients without having to add them to your customer list. Brightpearl POS also provides the option to undo a cash payment that was mistakenly processed. Open the trading day by entering your cash float, add cash in or take cash out of your till for any store expense that you may have to process throughout the day, and finally close the trading day securely. Use the payments report to outline all the cash movements during the trading day, a total for all sales and refunds that were processed, as well as the total expected value of each of the payment methods that you can use for reconciling the trading day. Our advanced search function allows the cashier to find products, whole product categories and run offers based on a number of fields such as a description, a SKU, or a barcode. The cashier can either enter the keywords or scan an item and the results are quickly populated on screen and ready to be added into the basket or explored for detailed information. Ensure you never miss a sale in store by having access to inventory information across all of your inventory locations. Having your POS integrated with your order and inventory management system allows you to offer a truly omnichannel shopping experience. A live view of activity across all channels, including in store, allows you to make better decisions about your business. Stay on top of inventory, sales data and product margins, in real-time. Meet and exceed customer expectations by having access to their whole history with you. Make refunds smoother and offer sales credits if they prefer it. 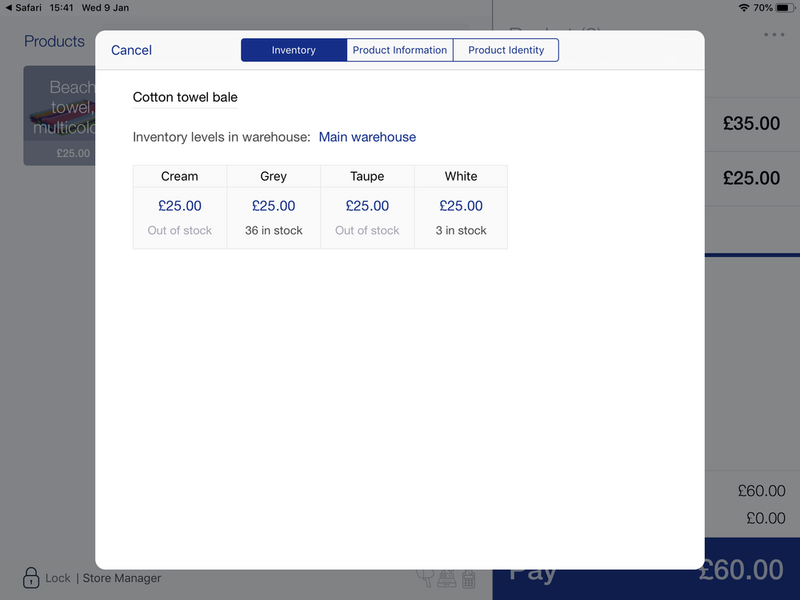 Email receipts and look up product availability across your warehouse(s) in seconds. Brightpearl POS is designed for retail businesses and is intuitive, easy to use and easy to implement. New staff onboarding time will be reduced, and both staff and customers can have a smooth purchasing experience. Seamlessly connect your brick and mortar stores with the rest of your business via an integrated retail POS system. Does Brightpearl POS work offline? It sure does! You can take orders while you're on the move and sync them with Brightpearl when you’re next online. To unlock the full features of Brightpearl POS, you need online access, but offline mode gives you the essential functionality that will tide you over until you next get connected. Can I take it with me to trade shows? Brightpearl POS is the perfect solution for trade shows. Our POS is designed to be customer-facing and mobile, so you can take it with you anywhere and get started with minimal hardware. Do I need to change payment gateways? Not at all. We integrate directly with PayPal Here at the moment, and are always assessing others. It’s not at all compulsory though, you can create and use as many payment methods per store as you need and continue to track all the payments and accounting within Brightpearl. How long does it take to get my staff trained? Some of our customers have quoted “a matter of minutes”. It’s very intuitive, and by virtue of being a POS, there’s no need for complicated or long-winded processes. Does it do refunds and exchanges? Absolutely. Everything takes place within a single cart - any items with a negative quantity are considered returned, and you can capture customized return reasons for each order to help improve service later. To turn a return into an exchange, simply have the replacement item in the same cart. When the exchange hits Brightpearl, it’ll be properly recognized as both a sale and a credit. See the benefits of Brightpearl’s integrated POS system in action with a personalized no-obligation demo from our business experts.